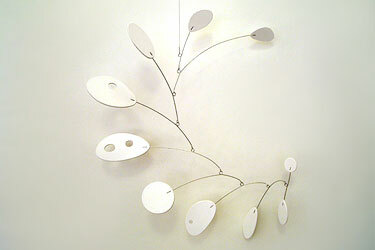 A beautiful mobile with organic shaped petals, some with holes. All at angles, tilted for fun underneath views. Babies love this mobile, lots of great comments from my clients. See Comments. Many of petals to colorize and match to your room's decor. Or go all white, clean and elegant. If hanging above a crib, please hang out of child's reach. Your baby will love the mobile, and will never out grow it. Video: Mobius Mobile in Motion!